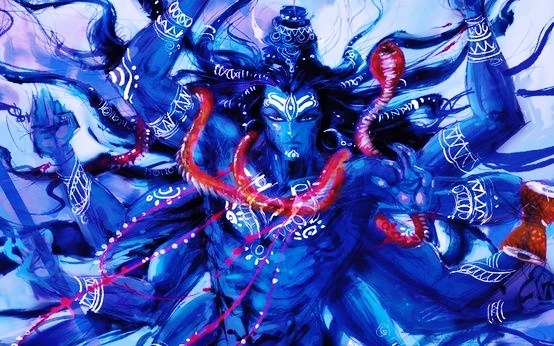 Maha Shivaratri or the great night of Shiva is a festival dedicated to Lord Shiva, a Hindu deity. Siva literally means ‘auspicious’ and Lord Shiva wields the power of destruction. How can destruction be auspicious? Is the name and the purpose a meaningless contradiction or a meaningful paradox that needs to be understood and appreciated? In simple words, Creative Destruction is the process by which new technology and innovation disrupts, destroys and displaces existing business, technology, industry, employment while adding value in terms of better experience, lower cost and more choices for the customers. Simplest way to understand this concept is to look at the automobile car industry that destroyed horse carriage industry and made many ancillary businesses worthless such as rearing and training horses, producing horse feed, leather working, saddle making, cart building, blacksmiths etc. Let us take a look at this graph. 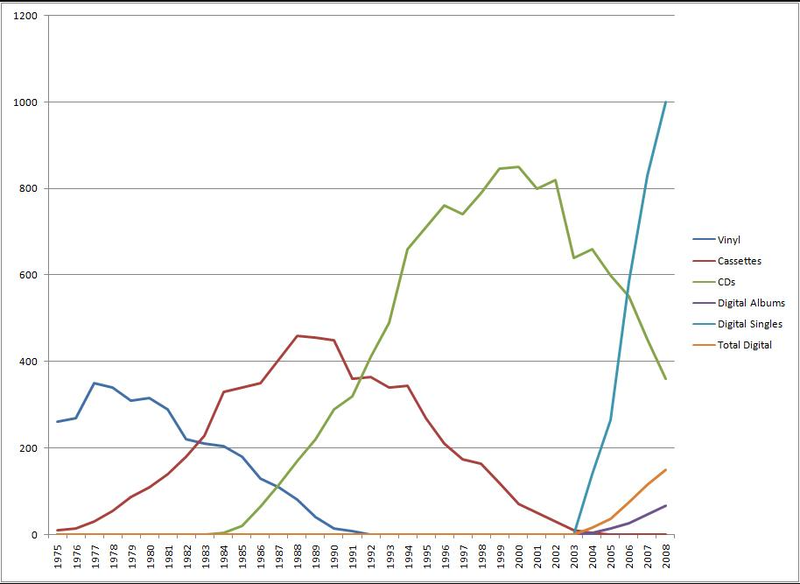 This graph shows how over time Vinyl and Cassettes are displaced by Digital music (iTunes, YouTube, etc. ), the decline/destruction of the former by the later. As an end customer, I am clearly better off with the lower cost of ownership, high fidelity in the quality of experience and ability to carry music with me. However for many businesses this means lost businesses, lost employment, obsolete stock / technology and ever shifting business models that need continuous investments. Lets take another example of newspaper ads business. 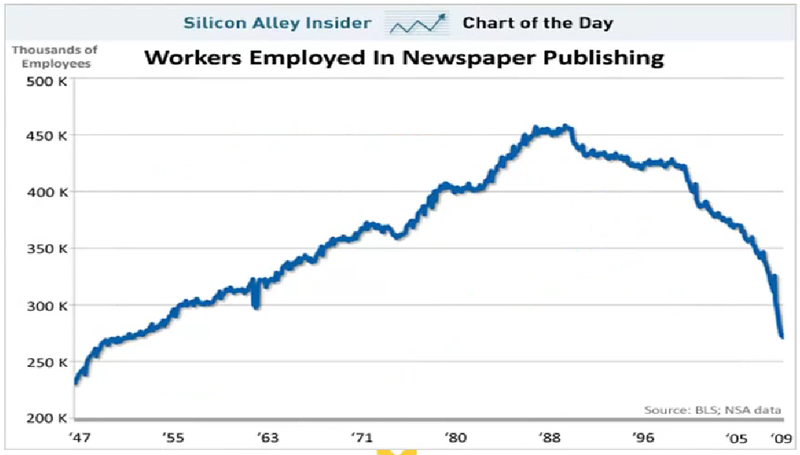 Just within a decade, internet and online media destroyed newspaper ads business. 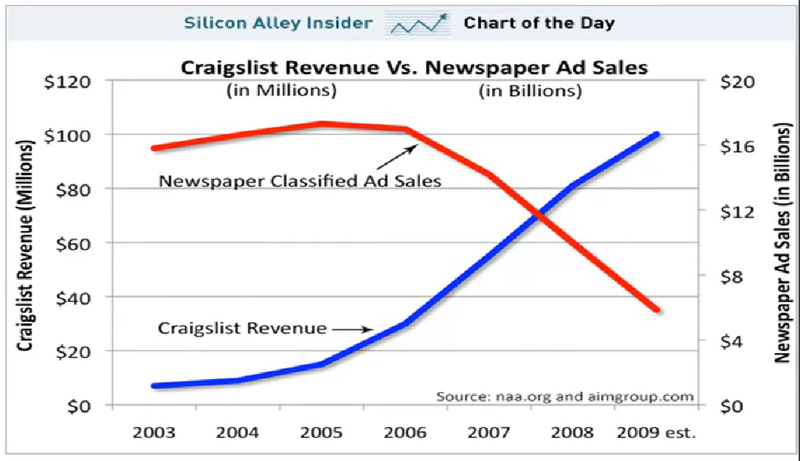 In the example below, you will see that Craigslist with about 30 employees displaced multi-billion newspaper ads business and ~200K jobs were lost to the onslaught of internet and online advertising. There are many such examples of creative destruction that we have seen in the recent past, be it Skype displacing international long distance calls or Smartphones alone destroying cell phones, PDAs, MP3 players, point-and-shoot cameras, wrist watches, calculators, voice recorders and many more industries to come. Is Creative Destruction good for the Society? The answer is an absolute yes. Creative Destruction is not only good but a pre-requisite for the growth and development of capitalistic societies. Schumpeter goes so far as to say that the “process of Creative Destruction is the essential fact about capitalism” as you saw above. Companies actively cannibalize / creatively destroys its own products to introduce new products. Microsoft Windows actively stops supporting older versions of its software as it introduces new releases. Apple takes away share from iPhone 4 user base to up sell iPhone 6. Microsoft recently laid-off 18,000 employees and continues to deliver increased efficiency earning higher revenue. Why is this important to know and how can I use this knowledge in my day-to-day life? I have used this concept in evaluating companies for investment purposes. I look for preparedness and history of the company to cannibalize their products and services to reinvent themselves. Their ability to change when Creative Destruction occurs in their industry as noted in their annual filings. From my job and skill set perspective, I am aware of possibilities and scenarios that could make what I do irrelevant. Creative Destruction impacts all of us, it is just a matter of timing. We can fall victim to the destruction or emerge as a victor with awareness and preparedness. Phoenix destroying its old self and renewing from its own ashes, the symbolism of a Serpent shedding and leaving behind its old skin to rejuvenate itself with the new skin of youthfulness and finally the concept of Shiva the auspicious becoming Shiva the destroyer to start the cycle of creation are all trying to help us find meaning in the paradox. ← Did you know of this prophecy?